The Aristotle University of Thessaloniki purchased a 2-acre piece of land in the area of Syntrivani Stadium in order to construct new schools. PAOK had to relocate and an area owned by the Ministry of National Defence at Toumba was chosen as the adequate location. Wing-commander Giorgos Themelis, then Minister of National Defence, granted the 7,5 acres to the club and also became the chairman of the committee overseeing the construction of the new stadium. The purchase cost was set at 1,5 million drachmas and was paid by PAOK’s administration in 20 six-month instalments of 75.000 drachmas each. On 7 February 1958, a committee of Third Army Corps officers delivered the land to “Double-Headed Eagle’s” representatives. There were still barracks on the premises, housing victims of the Civil War and the 1953 Ionian earthquake. Relocating all these people cost PAOK 70.000 drachmas. The total cost of the stadium’s construction amounted to 6 million drachmas, with just 1,1 million coming from the General Secretariat of Sports as subvention. Earthworks started in spring of 1958 and then construction work followed, based on the plans of architect Minas Trempelas and political engineer Antonis Triglianos. In an attempt to collect the necessary funds, the club issued the “Lottery for the construction of PAOK’s new stadium” in April 1958 at a cost of 20 drachmas each. Since 1956, the administration was withholding 15% of the gate income in order to fund the construction of the new stadium. The “Double-Headed Eagle’s” fans, apart from money, also contributed to construction by volunteering to work as builders! The construction of the stadium was completed at a record time of one year. 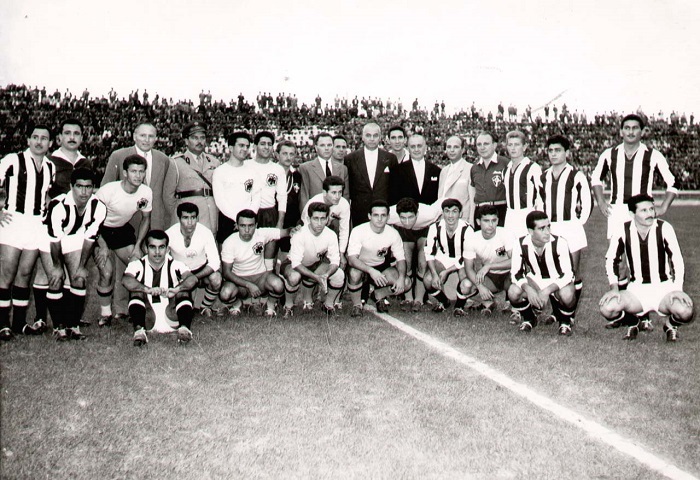 The inauguration event was scheduled for Sunday 6 September 1959 with a friendly encounter against AEK (PAOK prevailed 1-0 with a goal by Kostas Kiourtzis). Prime minister Konstantinos Karamanlis’ attendance was cancelled at the last minute. However several ministers of his government were there for the occasion. As for the ball for the first kick-off, it fell at 17.30 off an airplane of Sedes Military Air Base. 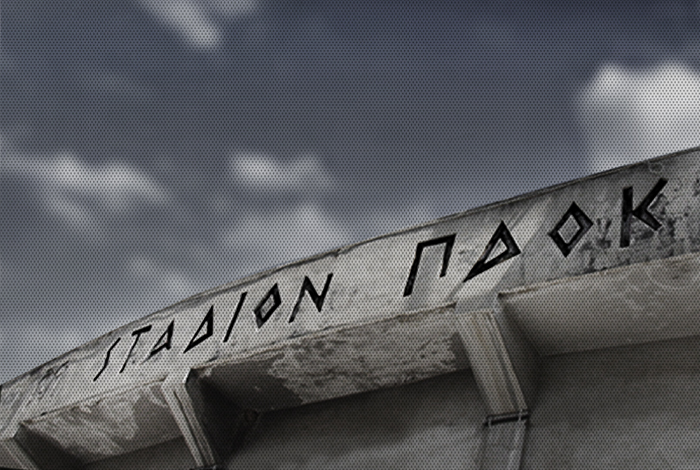 On inauguration day, 15.000 PAOK supporters packed Toumba, as that was the stadium’s capacity back then. It would increase to 20.000 seats in the following months until it reached a 45.000-seat capacity in the mid ‘70s through extensive expansion work. The attendance mark of 20.000 was broken on 28 April 1963 for the 1-1 draw with Panathinaikos (20.131 spectators), while the 30.000 mark was first surpassed in the 2-0 victory over Olympiacos on 19 March 1967 (31.504 spectators to be exact). The attendance record remains at 45.252 tickets and was registered on 19 December 1976 in the goalless draw with AEK Athens. After the Karaiskakis disaster of February 1981, security measures led to capacity reduction in all Greek stadiums. Toumba’s capacity dropped to 41.073 seats and, after the installation of plastic seats in all gates in 1998 and further security measures, it stands now at 28.701 seats. Part of the stands in Gate 8 collapsed on 22 March 1980, eighteen months after the Thessaloniki earthquake that registered 6.5 on the Richter scale. 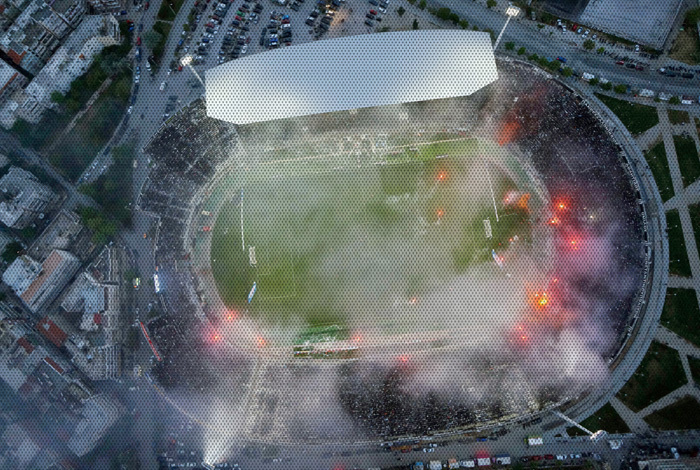 PAOK moved to Kaftanzoglio Stadium for the following year until the considerable damage was mended. After Mr. Ivan Savvidis took over PAOK FC in 2012, Toumba Stadium underwent considerable renovation work in specific areas: dressing rooms, entrance, offices, meeting room and presidential suite. All changes were implemented after careful study of the respective areas of big European football arenas. The toughest undertaking was renovation work in the dressing rooms, as it had to be done in the midst of a very busy season, leaving too little time in between matches. Those who have visited the home side’s dressrooms appreciate the special ergonomic seats for players, their personal space, the state-of-the-art audiovisual systems, the bathroom facilities and the cold hydrotherapy pool, that was deemed necessary for the speedy recovery of players after matches. The architects dressed the area in the black and white colours of PAOK, while the lighting is really impressive with the club’s crest in the ceiling adding to the effect. The innovated areas surely are the most impressive in Greece. 1957 On 11 May, PAOK purchased a 7,5-acre land (30.000 sq. metres) at Ano Toumba, for the amount of 6 million drachmas from the Ministry of National Defence. 1958 In an attempt to collect the necessary funds, the club issued the “Lottery for the construction of PAOK’s new stadium”. 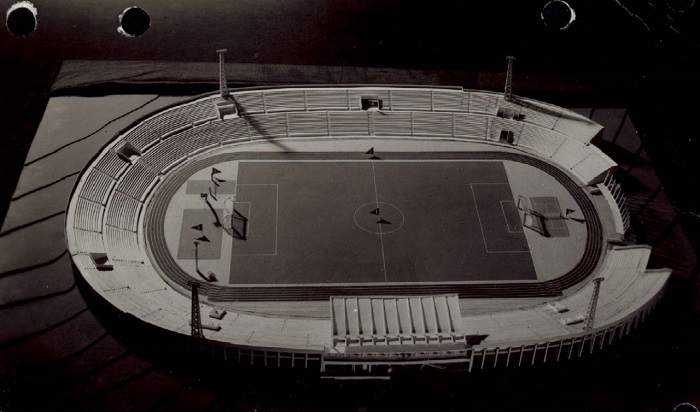 1958 The grounding works of the stadium, along with the erection of a 20.000-seat stand, kicked off in September. 1959 The inauguration of the stadium took place on 6 September with a friendly encounter against AEK Athens. 1959 The first official match at Toumba was held on 25 October. For matchday 1 of the newly-established A’ Ethniki Katigoria, PAOK played host to Megas Alexandros Katerini and won 3-2. The first official goal in the stadium was netted by the visitors’ Vangelis Karafoulidis, a former player of PAOK! Leandros Symeonidis got to score the “Double-Headed Eagle’s” first goal in their new ground. 1970 The first night match at Toumba was held on 20 May, against European champions AC Milan. 1974 The expansion of the stadium was completed and Toumba could by then accommodate 45.500 spectators. 1976 The attendance record of Toumba was broken, as 45.252 spectators flock in to watch the goalless draw against AEK Athens. 1980 Part of the stands in Gate 8 collapsed 18 months after the Thessaloniki earthquake that registered 6.5 on the Richter scale. PAOK moved to Kaftanzoglio Stadium for the following year. 1985 Gates 1, 2 and 3 got covered. 1998 The installation of plastic seats and the mandatory insertion of dead zones decreased Toumba’s capacity to 28.703 seats. 2004 The stadium underwent extensive renovation work, because of its use as training centre for the 2004 Olympic Games. A new metal roof was installed, as well as a new 4-storey building behind Gate 1. This building stages the dressrooms, infirmeries and doping room (ground floor), the offices (1st floor), the press conference room (2nd floor), the VIP areas (3rd and 4th floor) and the media tribunes. 2010 Propping-up work in Gates 7 and 8 was completed, while the press tribunes and media working area moved from the 4th to the 3rd floor. 2012 The areas of the offices, the dressing rooms, the press conference room and the presidential suite got revamped and expanded. 2014 An autonomous entrance for the mixed zone, the press conference room and the media tribune was added to the venue. The mixed zone was revamped, there was a separate media work area added to the press conference room, while the media tribune was expanded and moved to the top tier of Gate 3. The TV commentator tribune was also renovated in the 4th and 5th floor, with more seats added for European Cups games. In the VIP area of the 3rd floor, a new Hospitality room was created. A separate suite was built in the centre of the 3rd floor, to accommodate the veterans of PAOK.